The scene in Werrington on Sunday. 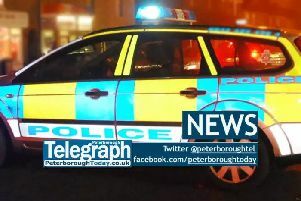 Two people were stabbed in an incident in Welbourne in Peterborough yesterday. Police were called at 5.12pm yesterday (Sunday October 1) by the ambulance service to reports of violence in Welbourne, Peterborough. The air ambulance also attended. A man and a woman were taken to hospital with stab wounds. The woman received serious, but not life-threatening injuries, and has since been discharged. The man’s condition is described as stable. Scenes of crime officers have attended the area and an investigation is ongoing. No arrests have yet been made. Police are looking for a man in connection with the stabbings but have not released a description of him or further details at this time. Anyone with information regarding this incident should call police on 101 quoting CF0564391017 or visit www.contactcambspolice.uk/Report/.